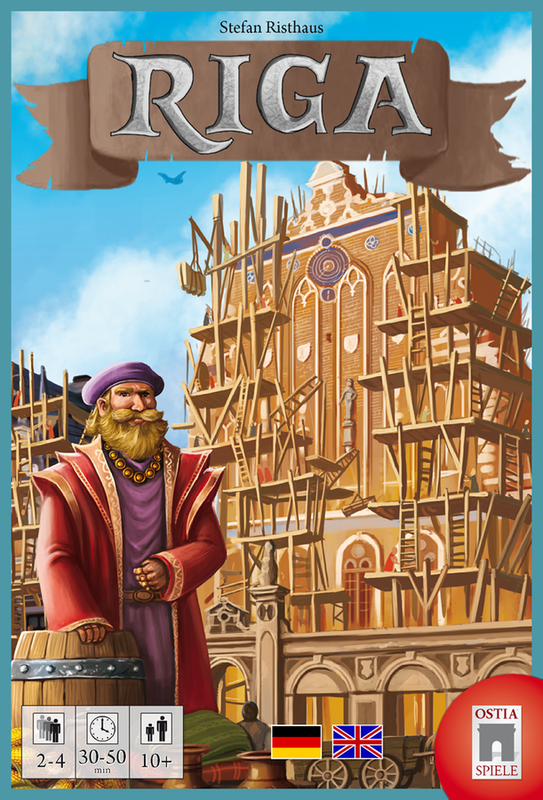 Riga is a card game consisting of two types of cards; commodities and buildings. Everything that happens in the game revolves around those cards. There are four commodities with differing values and 48 buildings (64 including the advanced Riga buildings) representing buildings from four nearby cities. Each round takes place over the four seasons. Most of the action happens in Summer and Fall while Spring and Winter serve as the set-up and clean-up phases. In Spring, the available commodities and buildings are set up for the coming seasons. Commodities are laid out in a number of rows 2+ the number of players. Each row is placed one card at a time until the commodities have a total value of at least 9. The available buildings are then placed until there are 2+ the number of players. If any buildings were available for only one previous year, then they are placed below a separation card. Any buildings that were already below that card are then discarded. During the Summer and Fall seasons the players can take one of two actions on their turn. They can either take a building or a row of commodities. After the action has been taken the player can build up to three buildings from their hand. How this works is the most interesting part of the game. Each building has a cost which can be paid by turning in commodities, but no change is given. You either pay the exact cost, or lose out on some value. Printed on the building card itself is the value of each commodity for that city. Two of the four commodities are the same price as printed on the commodity card, while one of the others has an increased value and the last has no value at all. I’m a bit of an economics nerd at times, so I love how simply this shows supply and demand. Each building is worth points, but they also offer some sort of feature that will allow you to gain something in future turns or at the end of the game. Some are abilities that can be used to provide end game scoring, others provide money or higher value to specific commodities and yet others provide a set collection type scoring goal. After the Summer and Fall seasons are taken in a serpentine turn order, Winter comes and the players must discard down to 6 cards (not including the Riga building cards). The game continues for 8 years (or 9 years with 3 players) and the player with the most points wins. Riga is a good game. It is pretty light, but the mini expansions add a bit more strategy to the game. One of the expansions simply rewards 3 points to the person who “donated” (overpaid when constructing a building) the most on one build. Each expansion adds just a bit more to the game, but the base game is good by itself. What I like most about the Riga is the tightness of the game and the management that you have to do to make sure you only have 6 cards at the end of each year. This means you can’t accumulate too many buildings or commodities which allows others to pick up what you may have wanted to take for yourself. One of my other favorite things are the combos you can make with the abilities. When you activate an ability that allows you to take an extra building and then use another ability that gives you money for every building with a knight, or peasant (the two set collection aspects), you can then build the third building that turn that you didn’t even know you were going to have. That building might allow you to do even more in the next year. They aren’t complicated combos, but they are fun to activate when they happen. The game is not difficult, but because of the supply and demand aspects it can be a little tricky to explain or suggest tactics. I have played it with some younger kids who picked it up pretty well though, so it isn’t too difficult.